Miller's SubArc DC Series, transformer/rectifier power sources combine high efficiency with the highest reliability. These machines feature a highly reliable thyristor power regulation. Newly designed digital control and communication electronics improve weld performance and simplify the integration of the equipment in more advanced applications. The new Digital Series accessories are powered with 24 VAC control voltage from the power source. All power sources, interface controls and wire drives are IP-23 rated providing a high level of protection for harsh environments. Our new SubArc power sources are easy to integrate by using a standard Modbus® connection. Different levels of integration are possible, from simple remote operation to more complex automated systems. Easy Paralleling of two machines to increase maximum welding current is simply done by connecting the paralleling cable from the first unit to the second unit. Daisy chaining multiple machines to gain higher output is done in the same way. No special tools, laptop or software needed... plug and play. The easy-to understand interface provides the operator with the necessary controls to set process parameters and control output. Our new SubArc Flux Hopper utilizes a flux valve mechanism that assures continuous delivery of flux to the arc. The unique valve design provides a barrier between the flux and actuation device to prevent jamming of the solenoid actuator due to dust and debris. A sight glass is provided on the front of the flux hopper allowing the weld operator to visually monitor the remaining flux in the hopper. By increasing travel speeds, reducing weld passes and minimizing arc-off activities, it is possible to improve productivity in the submerged arc welding (SAW) process. Joint design, polarity, torch configuration and flux/wire selection also play a critical role in helping companies get ahead. 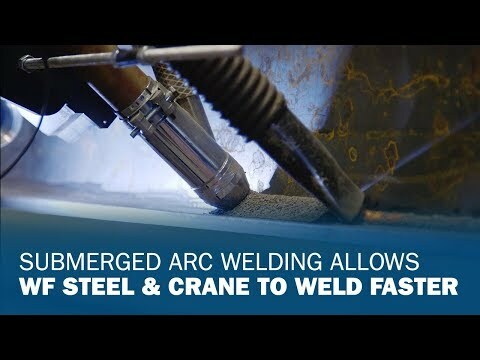 Seeking greater productivity and efficiency, especially on larger weld build-up jobs that could take days or even weeks to complete, Capital City Machine Shop knew it needed a new submerged arc welding (SAW) solution. Capital City’s investment in two SubArc AC/DC 1000 Digital welding power sources, coupled with a switch to Hobart® metal-cored wire, resulted in productivity increases of 240 percent on some jobs and deposition rates triple what they experienced with their previous system from another manufacturer.